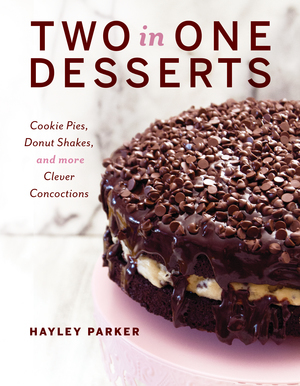 So a few weeks ago, Ashton from Something Swanky sent me an email asking if I’d like to participate in a “Recipe Redo” with a couple other awesome bloggers. But really, deep down inside I was like “yes! Finally, a chance to redo one of my favorite recipes that unfortunately had an ugly picture!” and my arrogant self heard that and was like “ugly picture? How dare you” and then I was like “yeah. You’re not perfect. Have you seen some of your earlier recipes? Some of the pictures are whack” and I was like “who says the word ‘whack’? Imperfect people. Away with you, psychopathic individual! !” and I was like “I live inside of you.” and then I stopped talking to myself and ate some macaroni and cheese. But BEFORE my mac and cheese (which was good, thanks for asking), I decided to email Ashton back and tell her I was down like Chinatown to redo one of my recipes. The problem was, I only got to choose one. Now, perfection aside, some of my older recipes desperately need a post/picture makeover. In the past, I didn’t have a true voice so some of the posts are gawky and awkward, like I’m a fourteen year old all over again. And the pictures are all over-exposed and have a disgusting amount of flash so everything I made looks bright, white and grossly… wet looking. EwwwwIknowaboutitdon’tbringitupEVER. Or you’ll kill my self-esteem and you don’t wanna do that, do you? 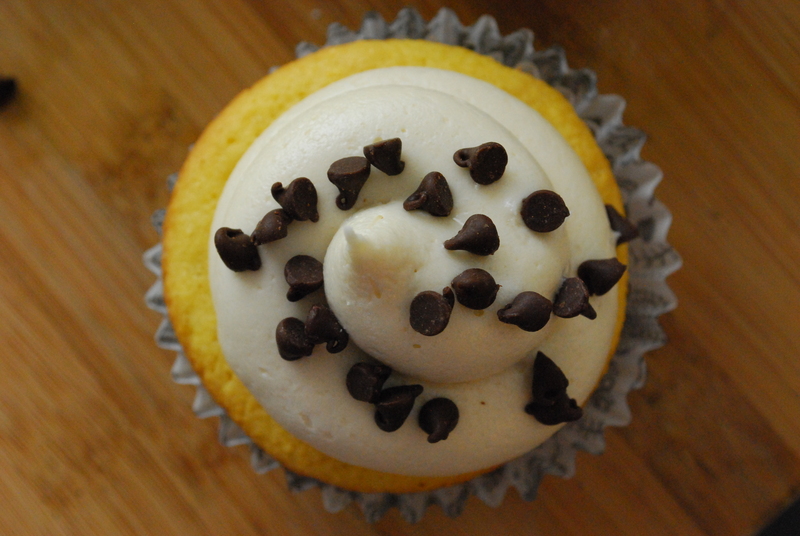 So I went with one of my favorite recipes and one that is talked about frequently to this day: my Chocolate Chip Cookie Dough Cupcakes with Cookie Dough Frosting. 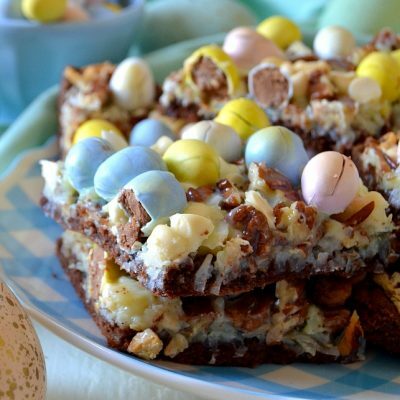 They’re insanely decadent, rich and not for the sugar-faint-at-heart. In other words, they’re the perfect cupcake. And today, they got a makeover!! I’m now proud to show you my artsy food-magazine-esque photography and revamped recipe. Identical in taste to the original, just appetizing-looking and doesn’t look like it went in a swimming pool before having its glamour shots taken. 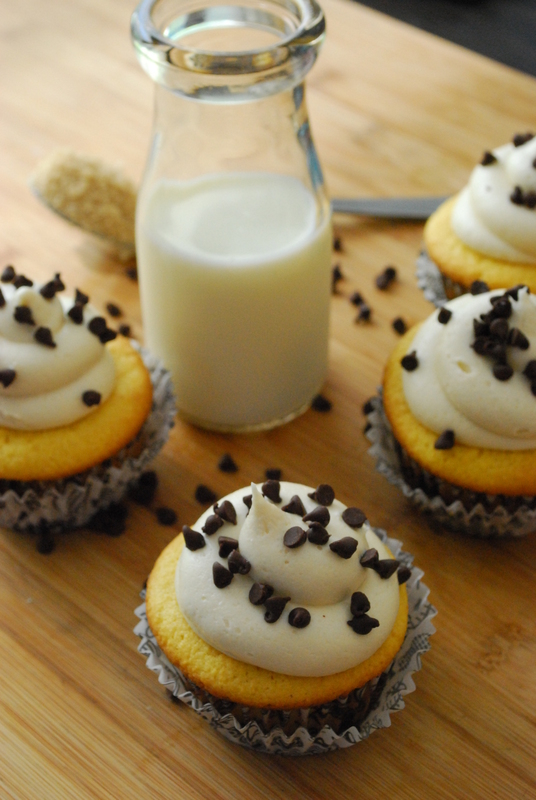 Chocolate Chip Cookie Dough Cupcakes pt. deux *inspired and redone by my original recipe HERE. 1. First and foremost, make your cookie dough. In a large bowl, combine the sugars and butter until blended. Stir in the vanilla and milk to combine. Lastly, add the dry ingredients and stir until a soft dough forms. Stir in the chocolate chips by hand. 2. Portion the dough into small Tablespoon-sized balls onto a foil-lined baking sheet (I simply used a cookie dough scoop and rounded them out with my fingers). Place the cookie dough balls in the freezer to harden completely, overnight if possible. 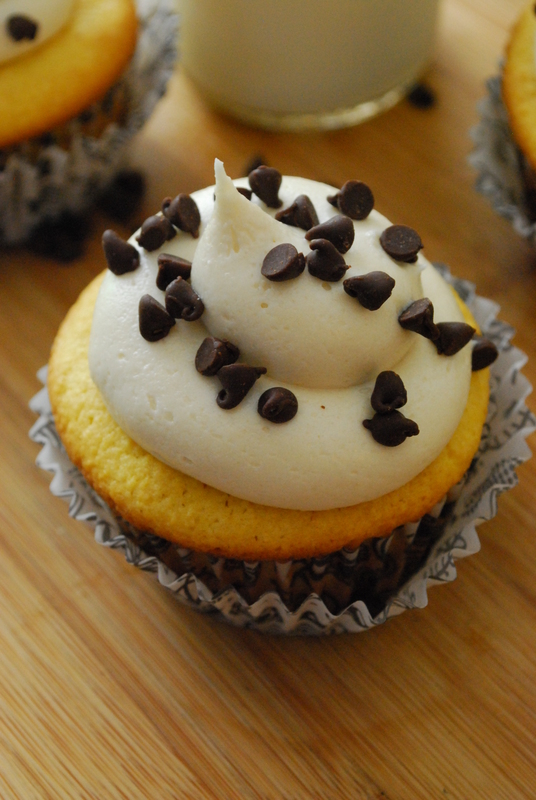 The dough needs to be completely frozen in order to not totally bake when the cupcakes bake. 3. Now, preheat your oven to 350 degrees F. Prepare the cake mix according to package directions; stir the vanilla pudding mix into the batter to combine. 4. Portion the dough evenly into muffin tins, filling about 2/3 full. 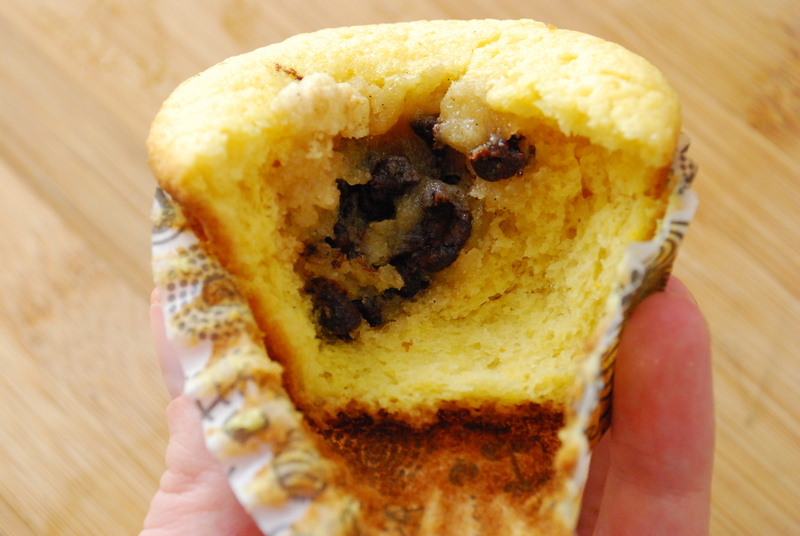 Drop a cookie dough ball into the center of each filled muffin tin; gently press down. It’s okay if the batter doesn’t cover it; it will sink slightly during baking and will be covered by frosting, anyways. Don’t cover it with more batter. 5. Bake for approx. 14-16 minutes or until a toothpick inserted near the edge of the cupcake comes out mostly clean. It’s okay if you slightly underbake them–remember, you don’t want to bake the cookie in the middle!! Allow the cupcakes to cool on wire racks while you prepare the frosting. 1. In the bowl of a stand mixer, beat together the butter, brown sugar, and vanilla until creamy and combined, about a minute. Gradually begin adding powdered sugar, about a cup at a time, until frosting is light and fluffy. 2. 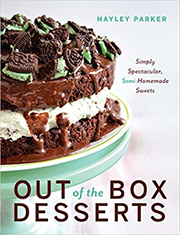 Pipe or spread frosting onto cooled cupcakes, ensuring you cover the filled center. 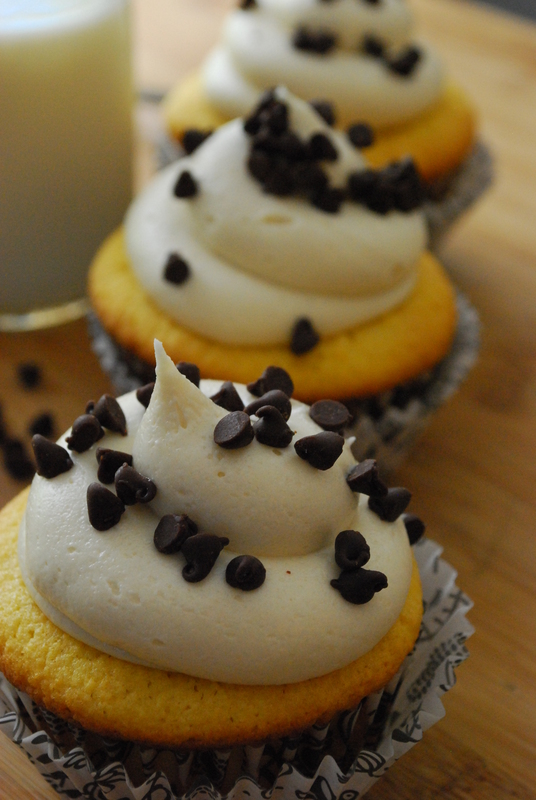 Sprinkle the frosted cakes with the reserved miniature chocolate chips. 3. Store leftovers airtight in the fridge, approx. 2 days. Best served the same day–and slightly warm, if we’re being honest. Cookie dough basically runs in my genetics–I grew up snacking on it as a kid, and when my mom was preggo with me, she ate raw cookie dough all the time. Perhaps my weirdness can be explained from her ingesting so many raw eggs and butter, but who really knows. Either way, these cupcakes rock and you should make them. You could say, they’re pretty much perfect. Be sure to hop on over to these other amazing blogger friends of mine to see what recipes they made over!! Since they’re all my blog friends, you can feel confident they’re perty perfect too. Wish I was eating one of those for breakfast right now 🙂 Such a deluxe cupcake – I love those black and white cupcake liners. Great choice for the re-do! Amazing, that’s what these are. And I’m imperfect enough to admit that at least the first 9 months of my blog needs a makeover. Honestly, I don’t think your original pictures were bad; but the new ones are fantastic! I could totally take a face plant in that frosting! I think I love you Hayley. Well, I know I do, but I this just make it more true and pure. 🙂 These cupcakes are awesome, and all your photos are fab! 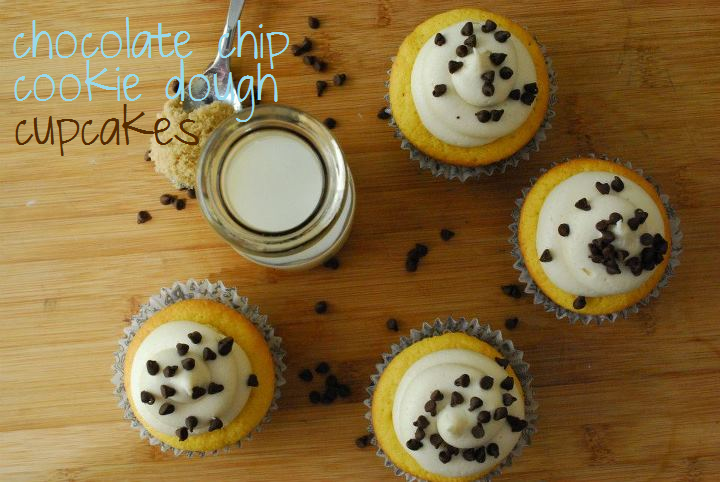 I love chocolate chip cookie dough so this is right up my alley! Yumm!! These are so incredible looking Hayley! I’m so glad I dared to mess with perfection– or else I may not have seen these 🙂 ANDOMGIKNOW— the writing in some of my older posts is almost more embarrassing than the photos. In fact, that’s why I picked the recipe I did for the Hop. I have way worse photographed desserts– but the writing on that one was excrutiatingly embarrassing. And of course I had to re-bake and re-photograph the entire thing to be able to re-write a post……. right? Love these! I’m wayyyy too into making anything cookie-dough related. I’ve been working on my own similar recipe but never finished it so now I drool over others’ recipes! I’m going to try these, thanks for sharing! I agree, though do not underestimate my willingness to eat bumper cookie dough. Sh*t is BOMB. These cupcakes were delicious! I love your blog and all the scrumptious recipes you have. My goal before the end of the summer is to try at least half of them. I won’t be losing any weight this summertime!